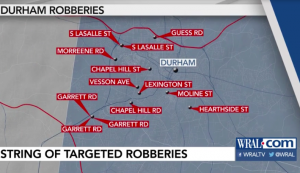 Durham Apartment Robberies Target Hispanic Community; Can Victims Seek Justice, Compensation? North Carolina apartment residents have a right to feel safe and secure in their own homes. Yet, while home owners can implement any security precaution they deem necessary to protect themselves and their families, apartment tenants are largely at the mercy of their property owner and management company to deter crime. Security measures may include gated-entry, fencing, monitored surveillance cameras, off-duty police patrols, private security personnel, bright lighting, and background checks for both tenants and employees. Sadly, such precautions are all too often neglected to limit financial exposure. This inaction and greed can have devastating consequences. The robberies raise grave questions about apartment complex security measures and what additional precautions property owners and management companies are taking to protect their tenants during this crime wave. Do not loiter in parking lots. Have your keys ready when approaching to enter your apartment or your vehicle. Do not carry large amounts of money or jewelry. If someone is following you, do not drive directly to your neighborhood. Instead, drive to a well-lit area. When you are walking, avoid strangers or groups of strangers. Park your vehicle in well-lit areas. Do not open your home door to strangers. Call 911 immediately. Victims of Durham Apartment Assault or Injury: What Are My Legal Options for Justice and Compensation? By law, North Carolina apartment complex owners have a duty to protect tenants and guests from any foreseeable harm. Should a property owner fail in this critical responsibility, they may be held civilly liable for any injuries, sexual assaults, or wrongful deaths suffered as a consequence. Compensation may be in the tens of millions of dollars. As each case and property is unique, victims of apartment crime should speak with an experienced security negligence firm as soon as possible to ensure all evidence, such as surveillance footage or broken lighting, is preserved and their best interests are protected.